What would the world be like without the koala? Koala Gardens is a beautiful property situated in the middle of a natural koala corridor. 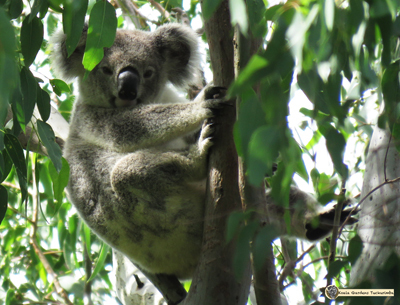 Koalas are very territorial and live in colonies, but they live separate lives. Mothers and joey's stay together until the joey is able to look after itself at which time it leaves mum to find it's own place in the world. While joey may stay within the colony, but males usually roam further to find a place of their own. The size and range of the colony depends completely on how much food is available. 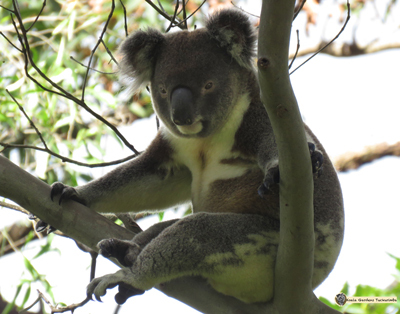 So we observe areas that have a lot of koalas relatively close to each other, and other areas where koalas have to range a long way to obtain enough food. A great example of how this works is demonstrated by the tireless work collecting daily data at Koala Gardens. Read more about the Colony and how it has changed over time. 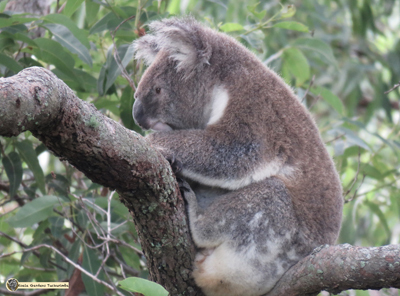 Koalas under stress are more likely to develop chlamydial diseases which increases their stress and risk. The solution in this world of high human populations is complex as the koala is battling so many risk factors. However, everyone agrees that more available food trees, in dense plantations, is the best thing we can do to assist the koala to survive. 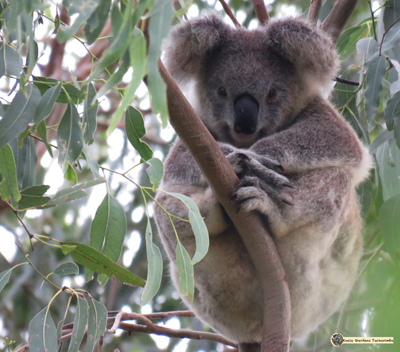 In fact, many koala experts are finding, just as Koala Gardens is, that providing a rich habitat reduces stress so much that koala populations can actually overcome disease and numbers quickly increase. 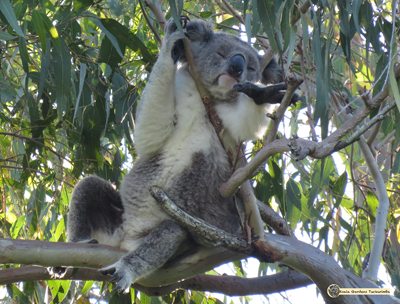 The next best thing we can do is EDUCATE people, worldwide about the koala and their needs. These two solutions are the dream of Koala Gardens. 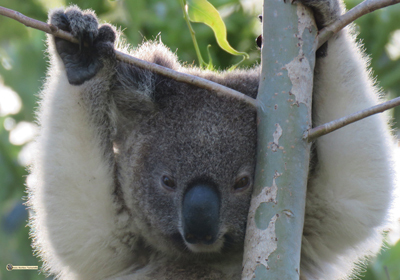 Through photographs, video and storytelling, Koala Gardens aims to provide an experience for anyone in the world to connect to wild koalas and understand their plight and have an opportunity to do something for the koala. the son of the colony matriarch Mist, his father is most likely to be Jordan. Enigma has the dark colouring of Jordan but resembles Mist more in other ways. He was born in October 2016 and emerged from the pouch in April 2017 and is pictured with Mist in the image below. He spent the first 6 weeks out of the pouch with mum browsing around the property and then they left for other parts of Mist's home range (her home range extends well beyond the property boundaries). To our delight in mid September 2017 Mist returned and settled Enigma into a section of young trees where she left him. He quickly settled in with a rich and varied food source. He was named Enigma because it took a couple of weeks of photographing him to finally obtain proof that he was indeed a 'he' and both Koala Gardens and the Facebook followers just had to give him a name! the matriarch of the colony, still breeding in 2017. Mist was one of the first koalas identified in 2014 using nose pattern recognition. You can see what a distinctive pattern of pink skin she has on her nose. This makes her very easy to positively identify. She has produced at least 4 joey's and is very competent mother. In 2018 we are now watching her with hopes that she has another joey in pouch providing yet another generation of hope. 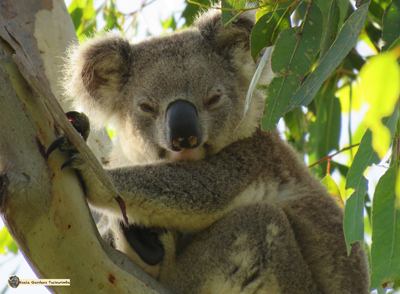 You can click here to adopt Mist for as little as $10 to help save wild koalas. an alpha male who rules over 90% of the property. Jordan is a huge boy with dark colouring that makes him easy to spot. You can see he has no pink markings on the outside of his nose at all, but inside each nostril. Jordan is a mature koala but his actual age is very hard to tell as we use the wear on a koalas teeth as the only accurate way to assess age. Jordan often only averages being seen on the property once a week so he likely has a very large home range. He has often been spotted on the property at a random time of the day and is then gone a few hours later, so it is very possible he moves through the property a lot more often than he is seen and counted. You can click here to adopt Jordan for as little as $10 to help save wild koalas. a young male, maybe Jordan's son or relative, who is hoping to become a ruling force one day. He has been in battles with both Jordan and Zorro at times, but he has stayed around and mated with Maxine so he is resilient! Legion often leaves the property for a few months at a time during the cooler months and has been seen in mature trees on a neighbouring property at those times so he has a large home range. 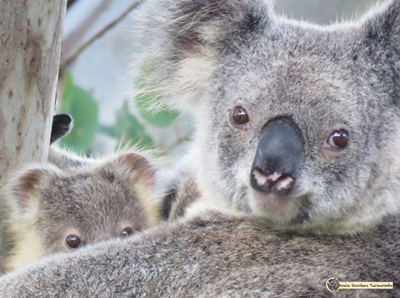 You can click here to adopt Legion for as little as $10 to help save wild koalas. the princess daughter of a princess! Stella is the joey born to Maxine and Legion in 2017 - born February and emerging from the pouch in August. She looks so much like Maxine most of the time now that she is independent that it truly takes using nose pattern recognition to be sure which is which! Stella is the first female joey born on the property that has stayed on the property after separating from her mum. the pretty princess who arrived late 2016 to steal hearts the world around, and attract the attentions of Legion. She is a young koala who hadher first joey in 2017 and is found at Koala Gardens nearly every day, so she has truly made this her home! Her beautiful joey Stella is nearly a carbon copy of mum, and she was the perfect mum teaching Stella all she needs to know to be wild and free. Racee had her first joey in 2017 - a beautiful female named Karla who grow fast into a health sub adult. When it was time for Karla to become independent Racee left the property for a while and settled her at a place we do not know. 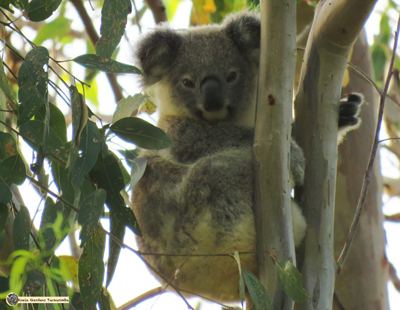 You can click here to adopt Racee for as little as $10 to help save wild koalas. the youngest of the girls on the property with the biggest ears in the universe. She holds her own even if she is the smallest and has settled in solidly. Thousand of people around the world have been watching Stevie grow up and enjoy to follow her through facebook. We expect Stevie has a joey in pouch early 2018 after possibly mating with Bullet in mid October 2017. You can click here to adopt Stevie for as little as $10 to help save wild koalas. The latest adult male to join the colony in 2017. Bullet arrived one day early in August 2017 and began to move around the property as though checking each section out. I never saw any interaction between Bullet and Zorro, but there were some serious interactions in September 2017 with another new arrival Takeshi. By September he was however often in the western zone which was Zorro's territory. Zorro has not been seen on the property since then and Bullet is seen on the property 3 - 4 days each week.